Grand Express train, Buy Grand Express train tickets online quickly and easily. 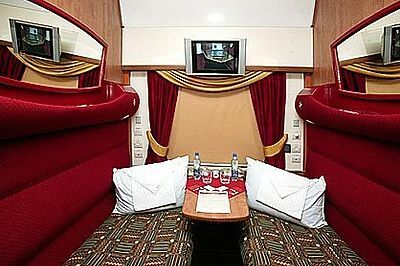 Grand Express is the most luxurious Russian train operating between Moscow and Saint Petersburg. 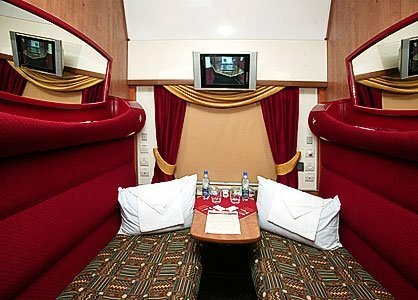 The train has 4 types of VIP cabins: Premium (with the size of an ordinary compartment), Grand (with the size of 1.5 ordinary compartments), Imperial and Grand Deluxe cabins (both cabins have sizes equivalent to 2 ordinary compartments). 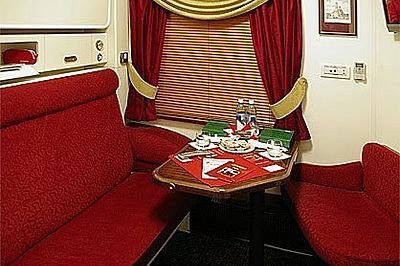 1st class cabin has lower berths for two people including bed linen and a few magazines. VIP cabins include everything as in 1st class and also a WC and sink. All VIP cabins except for Premium have showers. All VIP cabins are sold as one complete set (for one or two passengers). The ticket price includes travel sets for men and women, a hot breakfast and, depending on the type of cabin, supper. Regular 1st class and 2nd class carriages are also available on this train. 1st class tickets are available with and without meals. 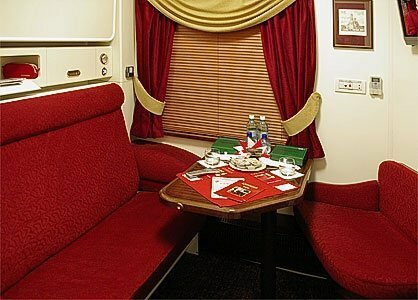 This St. Petersburg train has a very nice dining car that serves good meals. Also, travelers can order food and drinks to their compartment. Free Wi-Fi is available on board.